Did you know that you recycle a simple brown paper bag into an adorable rose pen for a fun Mother’s Day surprise? Follow the simple steps and you can make an entire bouquet for Mom’s desk in no time, with very little cost! This project is easy enough for older kids with a little help. 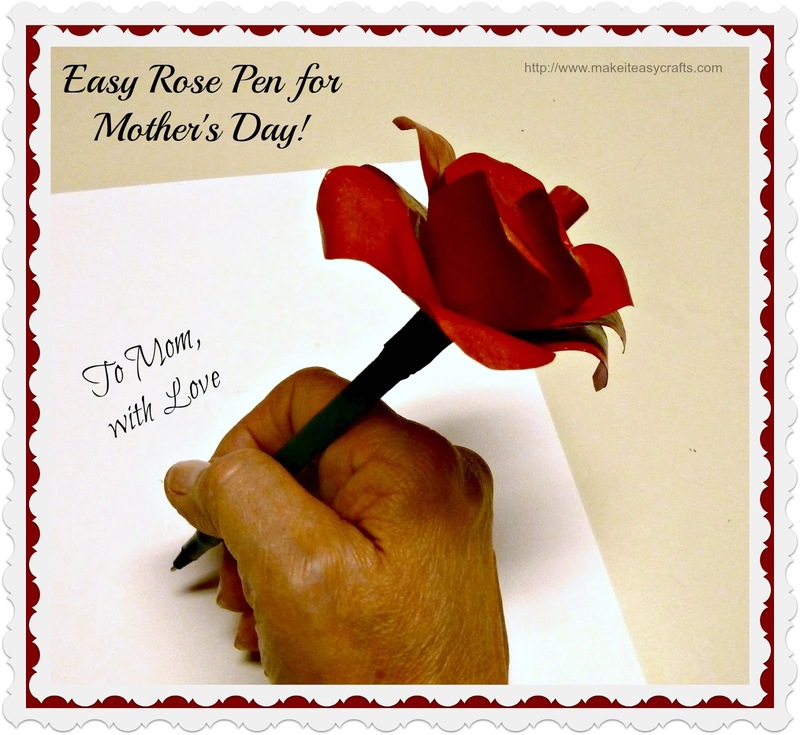 Your Mom will love her new rose pen and use it often! 1. Download the flower pattern and trace onto a piece of thin cardboard. Cut open a brown paper bag and lay it flat onto your work surface. Use the cardboard pattern to trace three flowers and cut them out. 2. Using the acrylic paint apply a coat of paint onto each flower. Let dry, turn over and apply a coat of paint on the opposite side. Let dry. 3. Use a ruler and coordinating marker to mark spoke like lines from the petals (See photo) do this on each flower. 4. Cut one section to the center of one flower. On the second flower cut out one petal. On the third flower cut out two petals. 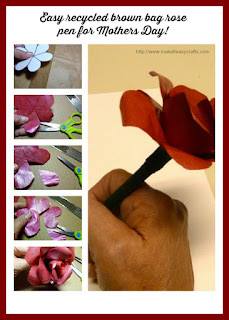 Save the cut out single and double petals, they will be the center of the rose. 5. On the first flower add some glue to the petal adjacent to the cut line and fold and attach the petal next to it. (See photo) It will look like a bowl. Repeat this step on the second and third flower folding the petals together. Let the glue dry. 7. Using the cut pieces of petal use the pen or a pencil to fold around and glue together. Cut the uneven end straight. 8. Insert the pen through the smallest center petal and slide up to the top leaving some extra at the end. Cut a small piece of packaging tape and secure this center petal onto the pen. Working from the bottom (pen point end) slide on the next sized center petal all the way to the first one. It will fit tightly. Use the small paintbrush to curl the petal down. 9. Continue adding each flower from smallest to largest and curling the individual petals with the paintbrush until you have added them all. Cut a small piece of tape and secure the last flower onto the pen. 10. Begin at the bottom of the flower with floral tape, twisting around the pen and down. Floral tape sticks to itself. Cover the entire pen up to the end.